Twitter Jack - "Controlling The Conversation"
What does he consider ‘healthy?’ Collectivism? To a left-winger like Dorsey, it seems to mean conversations aligned with his own ideology. In other words, Dorsey has no problem with his company regulating the tweets of users—especially conservative users. “Inclusive” is an SJW club buzzword. Inclusivity rarely includes conservatives. Does Dorsey consider himself a physician of conversation? After all, he keeps mentioning ‘healthy.’ He gets to diagnose what is relevant and valuable, not users. His prescription? Shadow banning conservatives. That participation is the utilization of an algorithm program that shadow bans conservatives. He means it’s important to get the right­ ­­– and silence them. Dorsey has widened the political divide by banning conservative voices on Twitter and he has done it for trifling reasons. On the other hand, those on the left such as Peter Fonda are not banned for tweets encouraging violence. Fonda screamed for Barron Trump to be kidnapped and raped. To be sure, there are trolls and impersonators on Twitter who should be banned. I’ve dealt with them at least a dozen times. The trolls used my name and face to tweet out horrible stuff in order to defame me. Twitter has been good about promptly removing them after I complained. It also helps that we now have a check mark that verifies our identity. Verification helps people act more responsibly and accountable to what they tweet out. However, the widespread shadow banning of Trump supporters have now forced us to add a red ‘X’ to our profile name. 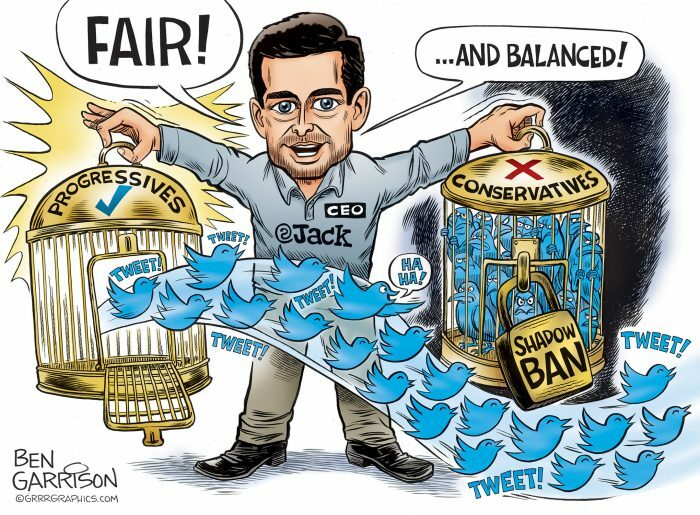 Every time you support GrrrGraphics, A cartoon gets it’s wings.. Shadow banning conservative voices is an assault on our First Amendment. That does not lead to open, civil, or healthy outcomes.